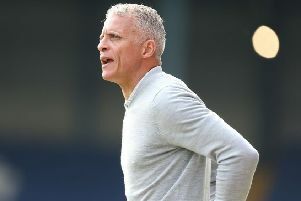 Caretaker boss Dean Austin says he won’t be paying any attention to Tuesday night’s Sky Bet League One fixtures - even though the results of a couple of games could go a long way to determining whether or not the Cobblers have a chance of avoiding the drop this season. Town’s relegation rivals Rochdale and Oldham Athletic play their games in hand tonight, with fourth-from-bottom Dale hosting play-off chasing Plymouth Argyle, who were beaten 2-0 at Sixfields on Saturday, and the fifth-from-bottom Latics entertaining mid-table Southend United. Currently, Dale are just a point ahead of the Cobblers while Oldham have a two-point advantage, and Town supporters will be hoping Argyle and Southend can do them a huge favour by beating them tonight and keeping things nice and tight going into the final two games of the campaign. Second-from bottom Milton Keynes Dons also play their game in hand on Town, and can move to within a point of Austin’s men with a win at Bradford City, but the caretaker manager insists he won’t be wasting any nervous energy following any of those games. Instead, he’ll be watching his son play for St Albans football team Harvesters, and then heading for a bit of fast food! “My son has a game tonight for his under-14 team, that I still coach, and it is a big top-of-the-table clash, and that’s where my head will be,” said Austin, when asked if he will be keeping tabs on the league one scorelines. “That will finish about 8.15pm, and then I’ll be dropping into McDonald’s on the way home as I have promised my kids I will, and when I get home I will probably watch the end of Liverpool against Roma. “I probably won’t even watch the (league one) results, and then people will start texting me, but I can’t influence it, I can’t do anything about it. The Cobblers will be hoping results are kind this evening, ahead of their must-win trip to Walsall on Saturday. Town are close to selling out their 2,000 allocation for the Bescot Stadium, which is great news, and Austin also revealed there is good news on the fitness front ahead of the date with fellow strugglers the Saddlers. “Everyone is fit,” said the caretaker boss. “Kevin Luckassen is fit for selection if needed, proving he has no reaction to the work we have done today, and Aaron Pierre is back in full training. “He has been for a week to 10 days, and he could come into the reckoning, it’s just whether I feel he has had enough match practice to warrant being involved.